Cavalier was one of the hundreds of Royal Navy destroyers and other vessels which fought to keep the sea lanes open and protect Britain's supply lines during WW II. She is a fitting memorial to the 142 Royal Navy, and 16 Allied/Commonwealth destroyers and nearly 13,000 lives lost in destroyers sunk during the war. 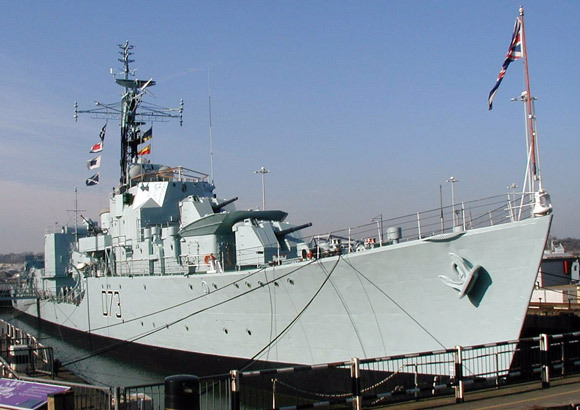 Completed in 1944, she began her career escorting Arctic convoys and participated in major operations off the coast of Norway. During 1945 she escorted RMS Queen Mary and RMS Queen Elizabeth, carrying troops across the Atlantic, chosen because of her speed capability. 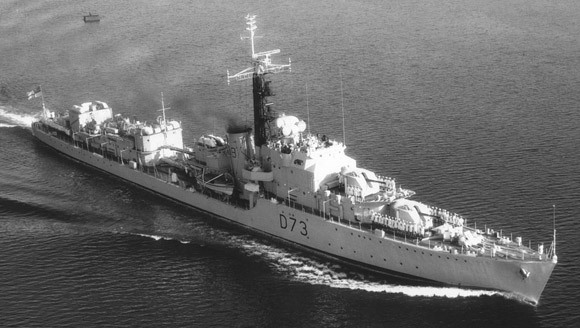 At the end of the war in Europe, HMS Cavalier joined the Pacific Fleet. Cavalier was decommissioned in 1972, and following great efforts in successfully raising funds for her preservation by the HMS Cavalier Association and others over a number of years, the ship is now on permanent display to the public in the south of England at the World Naval Base, Chatham Historic Dockyard, Chatham, Kent. This is the oldest Naval Dockyard in the world and Cavalier proudly rests in the same dry dock in which Admiral Horatio Nelson's flagship, HMS Victory, was built.